Mind over matter: "...describes situations in which a person seems to be able to control events, physical objects, or the condition of their own body using their mind. "-Collins Dictionary. SAN DIEGO -- Although it isn't, right next to the definition could be a picture of San Diego High's Parker Harvey. 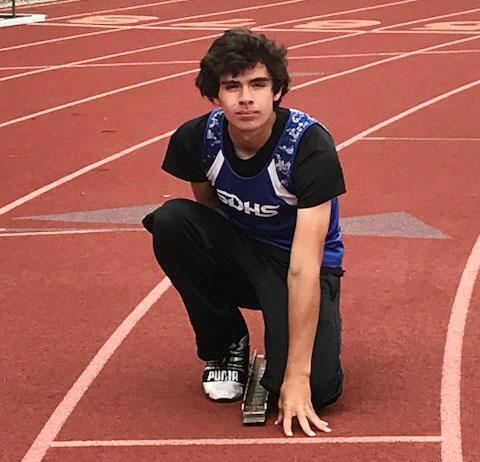 Harvey will be competing in the San Diego Section and, he plans, the State Championship track and field meets where he'll be the favorite in the 100- and 200-meter dashes. Only fair for someone who has already set his sights on the 2020 Olympic Games in Tokyo. If you're looking for times like 10.2 or 20.0, he's not some super wunderkind. But he is pretty super. Harvey is actually a better hurdler than sprinter only those events are not offered in the Paralympics in which he plans to compete. Harvey was born with Ambiotic Band Syndrome, a condition in which bands in the womb get tangled around parts of the fetus and as the body grows, the bands remain stationary, stifling growth in that part of the body. 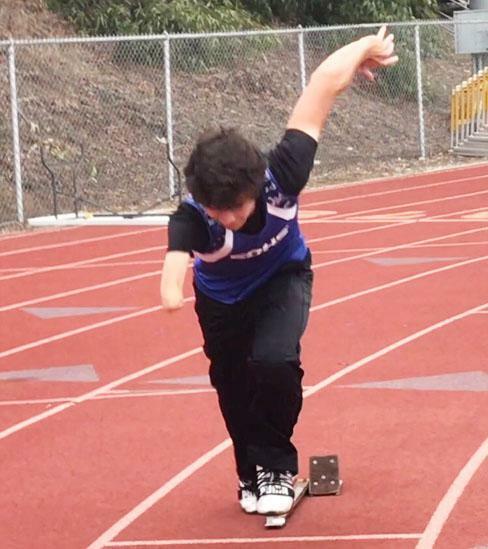 For the 16-year-old sophomore, it was his right arm which stops right above the elbow. "To me, it's just normal, it's the way that I am," said the soft-spoken but very direct Harvey. "I'm not coddled and my friends accept me the way I am. "I believe whatever you put your mind to, you can accomplish. I'm a hard worker and I believe you can achieve your goals with hard work." Mind you, Harvey played football as a freshman-defensive end and special teams mostly-and when he came out for track, he decided on his own to try the hurdles, an event that requires great balance which many would think might be hampered by having just one arm. Since Harvey didn't know that, he just hurdled as best he could, adjusting as he has his entire life without giving it a second thought. His teammate, junior Sonia Redon, one of the top girls 100-meter hurdlers in the section, watched, not really sure how he would do, as Harvey took his first flight of hurdles. "He was awesome right from the beginning," said Redon enthusiastically. "I was wondering, 'can Parker run; can he hurdle?' I watched and, oh my God, he was so strong. He had no fear and showed the hurdles no mercy. It was like he'd been hurdling his whole life." His best times-16.61 and 44.50-wouldn't make the section finals but he's the No. 2 hurdler on a good hurdling team. The PR in the 110s came in the Eastern League championships where he finished third. That for now is behind him, though, as he enters a whole new world. "I've never run the 100 or 200," said the 6-foot-1 Harvey before competing in both all by himself in the Ambulatory Division of the league championships, running 12.95 and 26.29. "It's a three-year plan for the Olympics and I'm starting right now. The only difference is I won't have any hurdles." He also won't have any competition, probably all the way through the state meet. "I'll feel lonely running by myself," he said. "I'm so used to having others run beside me. I'm disappointed they don't have the hurdles-maybe soon." He just shrugged off the possibility of being a pioneer because the truth be known, he sees himself a hurdler first. But, if he has to sprint to advance, so be it. He's already discovered what happens if you move your hand before the start, getting DQ's in the Jim Cerveny Invitational. Rules are rules. But he learned from that. Now he's working on trying to stay lower at the start, not needing to come up so quickly to address a high hurdle. "You learn from your mistakes," said Harvey. "I stressed out at (Cerveny) but by the dual meet (against Hoover), I was ready to come back and run. " Although Harvey says he hasn't really been bullied because of his arm, he says sometimes people don't think before asking questions. "The dumbest question I've been asked is am I right or left handed," said Harvey, shaking his head but breaking into a wide smile.